A bear owned by a man who used to offer people the chance to wrestle the animals mauled its 24-year-old caretaker to death during a feeding on property containing other bears, many wolves, and perhaps lions and tigers, authorities said Friday. The bear in the attack southwest of Cleveland was not one that owner Sam Mazzola used for wrestling, officials said, a practice that brought him the wrath of animal rights activists in 2006. His license to exhibit animals had been revoked but he apparently was still allowed to keep them on his property. A rescue squad took Mazzola from the attack scene Thursday night with an unspecified medical problem that Lorain County Sheriff's Capt. James Drozdowski said was not from any injury. Mazzola later checked himself out of a hospital and was expected to return to the property, Drozdowski said. Brent Kandra, of Elyria, died Friday morning at MetroHealth Medical Center, the coroner's office in Cleveland said. He had been taken by medical helicopter after the Thursday evening attack in Columbia Township. The bear was out of its cage for its feeding, "which was normal for this particular bear because the caretaker and the owner had been around it so much," Drozdowski said. Mazzola was able to get the bear back in its cage by using a fire extinguisher. "We don't know whether something startled the bear or what prompted the bear to get aggressive with the caretaker," Drozdowski said. "We do know that it got aggressive with the caretaker and mauled him severely." Authorities will investigate before deciding whether to pursue any charges. The property held about seven to nine bears and 20 wolves, and possibly a lion and three or four tigers, Drozdowski said. 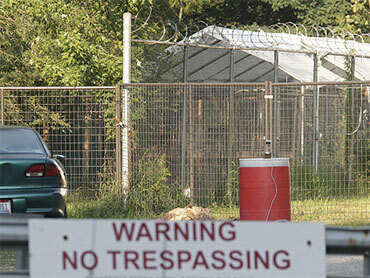 The gate was closed Friday with a no-trespassing sign posted, and three sheriff's deputies were posted nearby. Raymond O'Leary, 76, a retired Cleveland police officer who lives around the corner from Mazzola's property, said it was like living "next to the zoo." He said it was worrisome knowing there were exotic animals in the neighborhood. "It's a concern to all of us," he said. "We can hear the animals in the evening, at feeding time, roaring over there." When he moved into the area two years ago, he said, a neighbor showed him a video of a tiger loose on their street. "They caught the tiger" without incident, O'Leary said. Mazzola used to offer people the chance to pay to wrestle a black bear at the annual Cleveland Sport, Travel & Outdoor Show. People for the Ethical Treatment of Animals, based in Norfolk, Va., four years ago made Mazzola a focus of its national efforts to ban bear wrestling and demanded that the U.S. Department of Agriculture take away his license to exhibit exotic animals. Drozdowski said he understands that Mazzola's permit to exhibit was revoked, but said he did have permits to keep the bear and other animals on his property. "We don't know yet what actions may be taken regarding the bear, but right now the bear is secured and there are no plans at this time for destroying it," he said. Messages were left Friday for U.S. Agriculture Department officials, and for PETA. This year has seen other fatal bear attacks, though typically involving animals in the wild. In April, a 6-year-old girl from northern Ohio was killed by a black bear while visiting the Cherokee National Forest in Tennessee with family members. A grizzly bear mauled three campers in Montana near Yellowstone National Park in late July, leaving one man dead and two people with serious injuries.